Making seasonal bakes has to be one of my all time favourite things to do! This time of year where I can tailor my recipes around Halloween, Bonfire Night and Christmas is so much fun! Speaking of Halloween, this is my first pumpkin recipe of the year! Pumpkin doesn't really get used all that much in the UK, if at all! Normally our pumpkins just get carved and that's it! It can also be difficult to find tinned pumpkin if you don't want to make it from scratch, I managed to get some in the American section of Tesco! 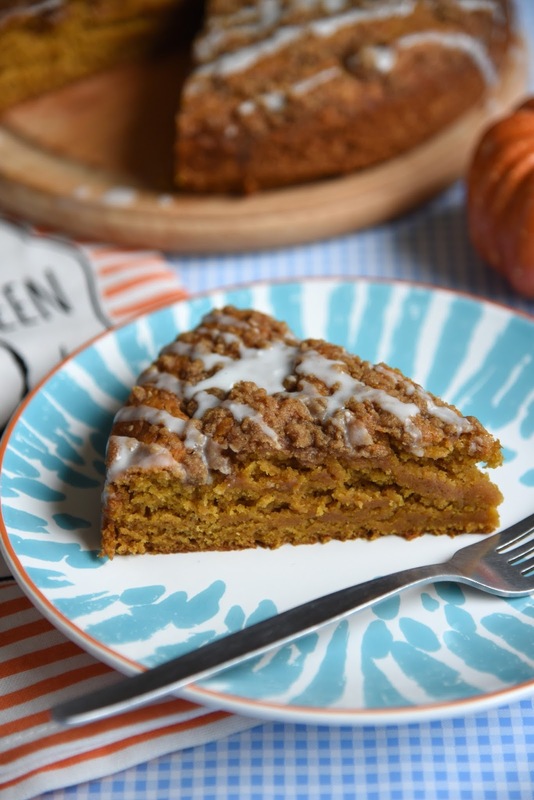 So this recipe is an Iced Coffee Pumpkin Cake, it's called coffee because it's supposed to be enjoyed with a cup of coffee and doesn't actually have any coffee in it. 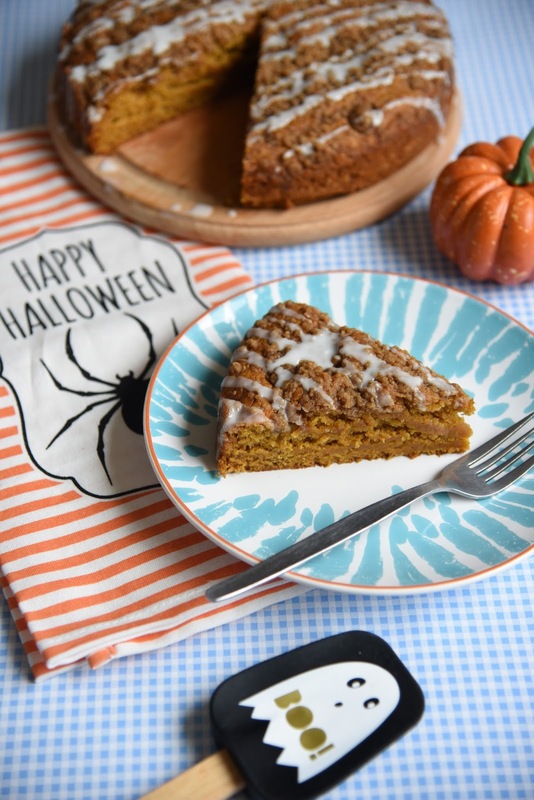 The pumpkin here acts as a binder in this recipe so it doesn't have any eggs in, which makes for an extremely light moist cake, the spices and pumpkin work so well and it's honestly delicious! 1. Preheat the oven to 170°C. Grease and line a 9-inch square or round baking tin. Set aside. 2. Make the crumb topping first, in a small bowl, toss the flour, brown sugar, salt, and cinnamon together. Cut in the cold butter using a pastry blender or a fork. Mix to create clumps and crumbs. Set aside. 3. To make the cake, whisk the flour, bicarbonate of soda, baking powder, salt, cinnamon, nutmeg, and mixed spice together in a large bowl until combined. In a medium bowl, whisk the pumpkin, brown sugar, oil, maple syrup, and milk together until combined. Pour the wet ingredients into the dry ingredients and stir until just combined. Try not to overmix the batter. It will be very thick. 4. Spoon the batter into the prepared baking tin and even out. Pour the crumb topping evenly on top and gently press them down into the batter. 5. Bake the cake for about 30 minutes until risen and golden and and a toothpick inserted in the centre comes out clean. Leave to cool in the tin for 10 minutes before placing onto a wire rack. 6. To make the glaze, whisk the icing sugar and 1 tablespoon of milk together until smooth. Add more milk to thin, if desired. Drizzle over cake, slice and enjoy!